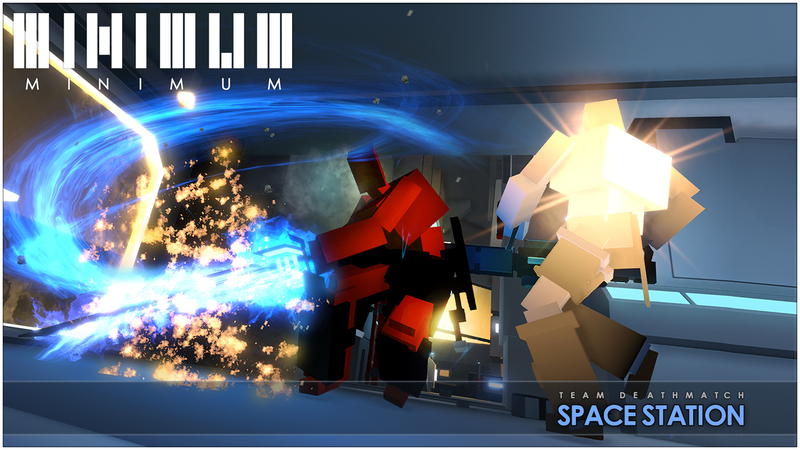 Minimum is a sort of mixed bag of shooters and genres that have come out over the past few years. It seamlessly blends Quake 3, with a little Unreal Tournament, and even adds in some MOBA excitement. The basics of the game involve running around and killing enemies, while you do that you can collect orbs which upgrade your weapon to fire more rapidly or enable a spread shot. The curve is thrown at you when you realize that not everyone has a gun…but there are those who run around with a sword. It’s those enemies that will cause you the most grief…it’s those guys that you need to watch out for. As I said Minimum blends those famous shooters with a touch of MOBA. How does that come in you ask? Minimum has three game play modes and they all are really fun to play. There is a standard team deathmatch with some decent maps, and a horde mode (thanks Gears of War 2) that sees you fighting creatures, and enemies dressed as ninjas or pirates. Well the main and most fun mode of Minimum; Titan Mode charges you with the usual shooting and slicing your enemies but each team has a Titan. Each Titan walks a line towards the others and each titan is protecting a power core. The maps also spawn npc to kill (known as minions) in MOBA’s, killing these will strengthen your titan. If your teams titan dies he will respawn, powered up by the minions that your team has killed. This mode requires that you stay on your toes and wear a variety of hats while on the battlefield. While your titan marches towards the enemies you can unleash your fire power on your opponent’s titan. All the while fighting the enemy team, and killing creeps to keep your titan powered up. 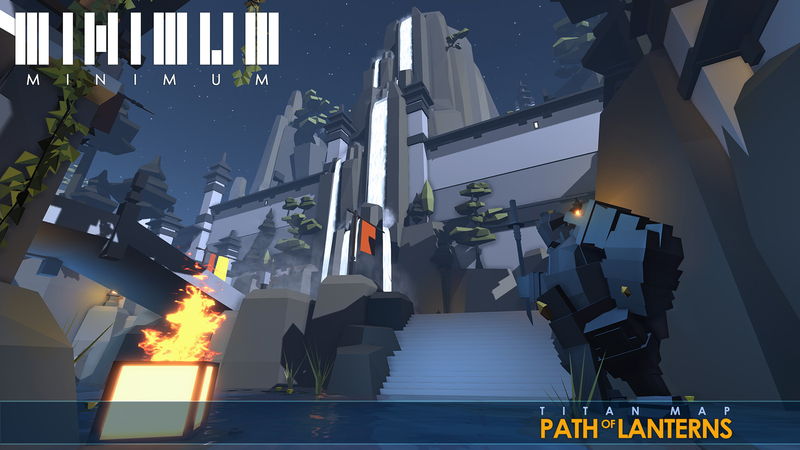 If your titan happens to fall in battle you will need to fall back and protect your base until your titan’s respawn. It’s quite the game of tug o war, but it’s a blast to play. The biggest problem that I have with the game is not the minimalistic graphics. In fact I love that everything about this game uses its name sake. There is no health bar, no ammo bar, no real graphics just shapes and colors. But it all works, and it all works excellently. No, the problem comes into play when you run into your first sword welding opponent. All in all the guns and things are pretty balanced. There is the usual assortment of shotguns, machine guns, and launchers, but once you run into a blade welding maniac you will either die by the blade or get a lucky precise shot off. More often than night you will fall to the sword. That is not to say that it takes away from the fun, but those that choose to use a sword get increased agility. Which means they can close the gap between them and a gun wielding opponent and within three or four strikes will destroy their opponent and pick up the power up from there fallen foe. Even if the melee combat has a slight edge (one I hope gets patched out) the game offers a crafting system which enables you to build better weapons. While playing the game and slaying opponents you will pick up crystals that will carry over with you and enable you to craft better weapons. So the issue is as you level up your weapons and build better ones, those that walk the path of the sword will be doing the same. Cool thing is that some of the swords look like lightsabers, which is really awesome to see someone duel welding purple blades. The only mode where you won’t see chat from people calling out “Sword N00bs” is the Horde mode. That is of course because that is a co-op mode where you need to work together to defeat a bevy of opponents so if you are swinging a sword around like a veritable Jedi Knight no will judge you because it’s for the greater good. Plus as the rounds roll on, you will fight harder opponents like dinosaurs or pirates. Basically enemies who don’t care about your skill with a blade and it would be best to defeat with a gun. In closing Minimum is actually a lot of fun, if a little rough in places. There are a few of the crafting components that are blacked out or marked coming soon, ranked matches is not working right now and the game will crash at times. Even with all of that the game is still a joy to play, I just hope that the developer Human Head will work out some of the kinks and actually update and add new maps, and crafting options to this little gem.